Setting up the tight-rope is so simple! Find two trees or fence posts or deck rails that are fairly close together. I’ve used a tree and a clothes-line pole to tie our ropes to. Position one rope about a foot to a foot-and-a-half off the ground, and secure it to one of your trees/poles. 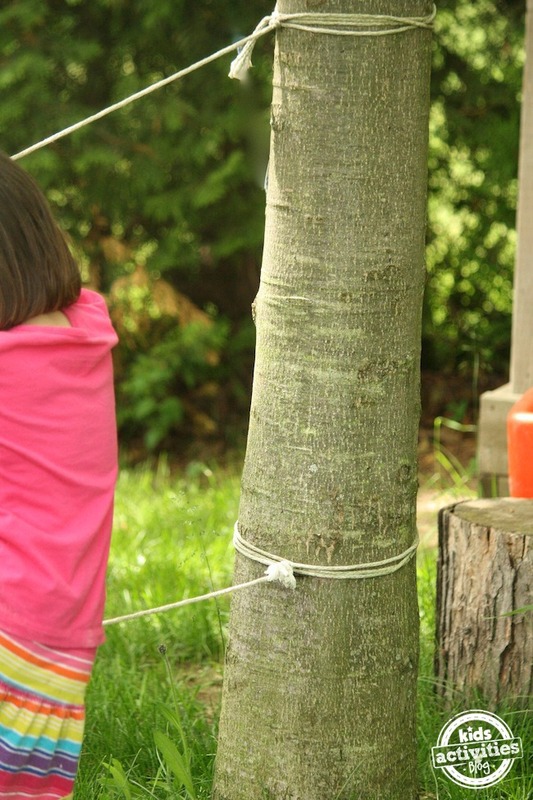 Wrap your rope around the tree or pole several times before tying a knot to secure it in place. 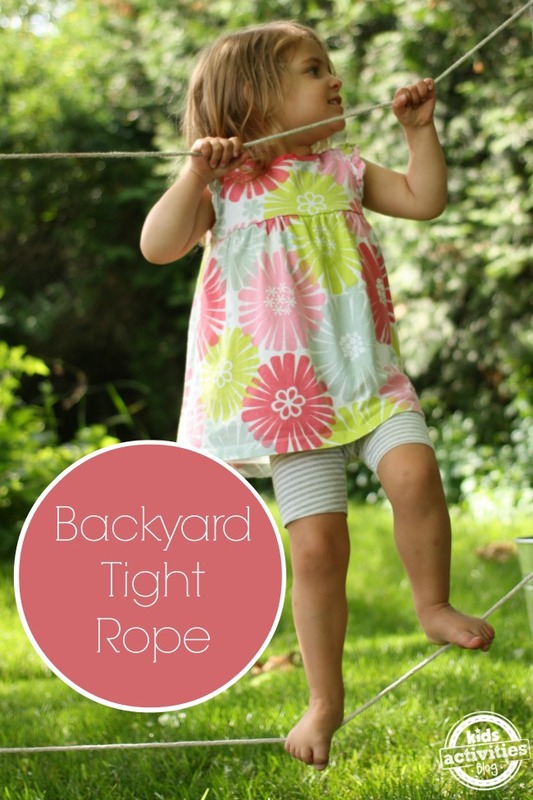 With the loose end, pull the rope as tight as you can – this will help to keep your rope as taut as possible when your child stands on it. Secure the other end of the rope around the second tree or pole, using the same method as before. Position the second rope several feet off the ground. Ours is about 3 feet up. To get a good idea, have your child raise his or her arms slightly above his or her head. This is where you want to position the higher rope. You want it high enough that they have to reach up for it when they’re standing on the ground. To ensure this activity does not pose a danger, do not leave any ends of the ropes dangling loosely. Secure any extra length in place by wrapping and knotting it or by cutting it off. That’s all there is to it! Now it’s time to call over those adventurous children! Depending on the age of your child, it may take a few minutes for them to get the hang of it. That bottom rope will be quite wobbly as they work to figure out the mechanics of it all. But just you watch! Before long, it will click, and they’ll be able to balance on the rope like pros. My guys love to side-ways walk from one end of the rope to the other. They also love sitting on the bottom rope, and swinging and hanging from the top rope. If you’re wondering how old a child might have to be before they enjoy an outdoor activity like this, take a look at this little hooligan. In the photo on the left, she’s 18 months old. 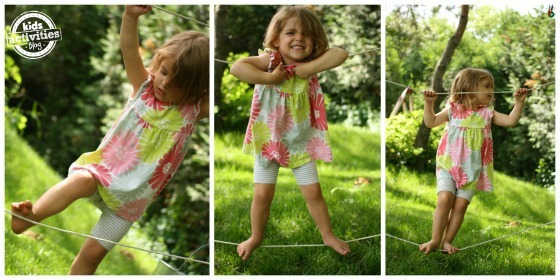 She was obsessed with the tight-rope from the moment she discovered it. It didn’t take long at all before she could stand on it. 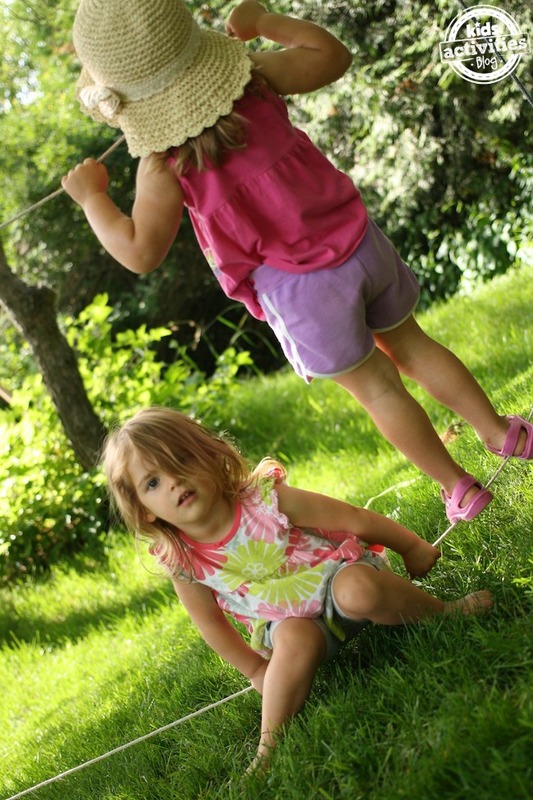 In the photo on the right, she’s 2 and a half, and clearly, a expert tight-rope walker. 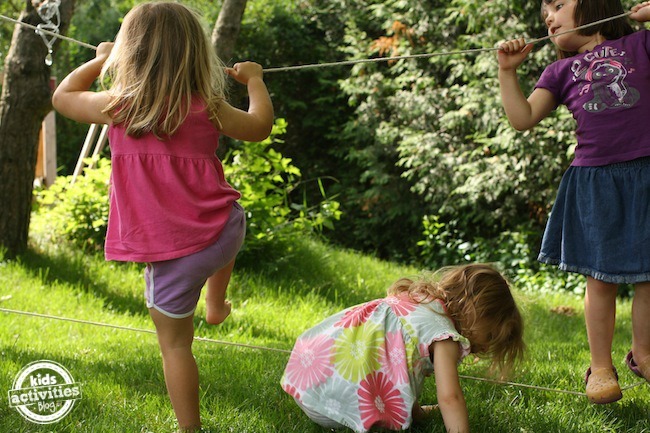 Our tightrope is a perfect backyard activity for one child, or a great, little gathering place for a group of kids! What are you waiting for? 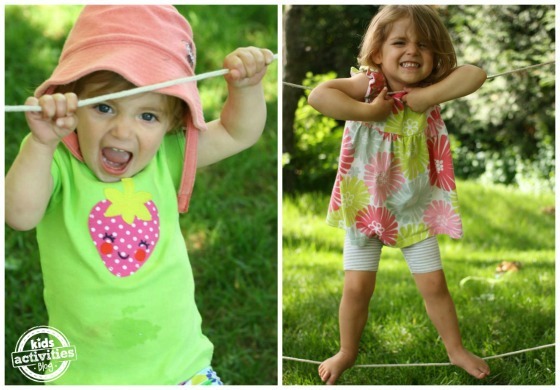 Head on out to the backyard, and rig up a tightrope for your kids today For more easy, inexpensive ways to help your kids with balance and co-ordination, check out these 10 backyard balancing activities for toddlers. 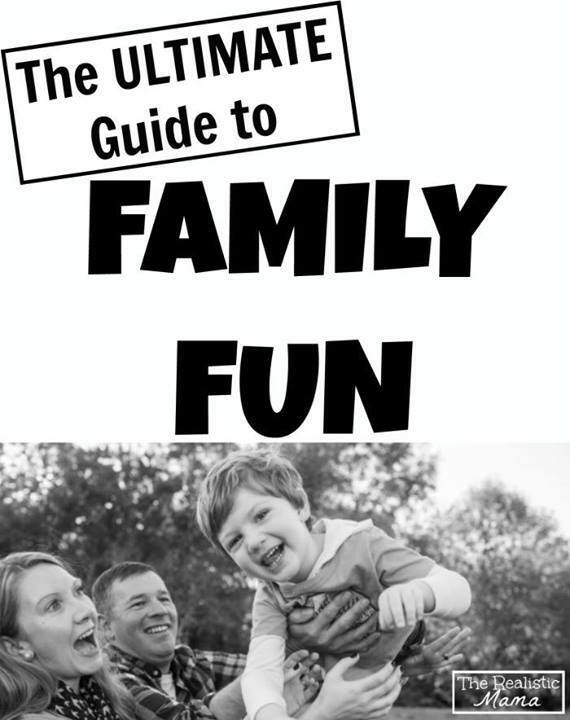 Check out some of the other amazing blogs and their family fun ideas! Follow Alida | The Realistic Mama’s board Everything Family Fun on Pinterest. Jackie Currie is a mom, daycare provider, and the creative spirit behind the blog Happy Hooligans. 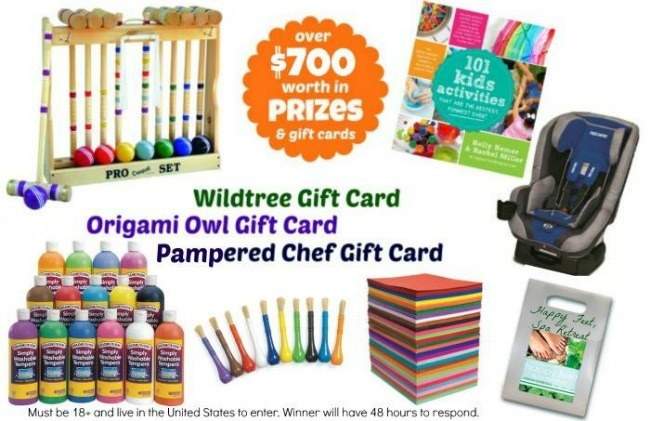 A self-proclaimed glitterphobe, she specializes in easy, affordable crafts and activities for toddlers and preschoolers. You can also find her on Facebook, Pinterest, Twitter, and Google+.